Should I hire an attorney to help me with my Georgia truck accident claim? You should hire an experienced Atlanta truck accident lawyer to help you with your Georgia truck accident claim if it has resulted in the wrongful death of a loved one or if you have sustained a serious and life changing injury because of the truck crash. An Atlanta truck accident lawyer can help protect your legal rights during the often complicated Georgia truck accident claims process. Truck accident cases are more complex than most personal injury claims because of the complexities of federal laws governing interstate truck commerce and safety as well as the distinct possibility that one or more parties may be ultimately liable for your truck accident injuries. There is also a lot of evidence you will need to gather to help substantiate your Georgia truck accident claim that may be difficult for you to obtain on your own. This can include the log books or electronic records from the truck itself as well as the vehicle's maintenance records, information about the driver, and so on. An experienced Atlanta truck accident lawyer knows what kind of evidence to look for and what may constitute negligence on behalf of the trucking company itself as well as other potential third parties based on the specifics of your truck accident. Because of the complexity of these types of cases, working with an attorney is recommended only in cases of severe injury or the death of a loved one. If your injuries and property damage are minor, you can most likely settle with the insurance company on your own, though it still might be a good idea to at least consult with an Atlanta truck accident lawyer about your options. Attempting to settle with the truck company's insurance carrier is not a good idea for severe injuries as they will not take into account the full spectrum of your injuries, including long-term care. If you have an Atlanta truck accident lawyer working on your side, you will have a personal advocate working for a settlement that will address your current and future medical needs as well as quality of life issues. If you or your loved one has been the victim of someone else's negligence or carelessness, in a Georgia truck accident, you have certain rights guaranteed by law. To help you understand these rights and seek the compensation you may be eligible for to help get your life back in order, contact the Atlanta Law Offices of Sheryl L. Burke for a no-cost consultation on your injury case. When you agree to an out of court settlement for your Georgia personal injury claim you are choosing to avoid taking your case to trial. In an out of court settlement no judge or jury will be present in the decision process of your Georgia personal injury claim. An out of court settlement is also known as a negotiated settlement and involves both parties, as well as their attorneys and, in some cases, a conflict mediator. There are advantages and disadvantages to the out of court settlement process and many reasons why either party may seek this type of resolution. In some cases, one or more parties may wish to keep the details of the Georgia personal injury claim private and out of court records. Out of court settlements also result in lower legal fees and negate court fees, so they may allow for a more substantial settlement amount to the plaintiff. When you are unsure about whether an out of court settlement is appropriate for your Georgia personal injury claim, you should consult with an Atlanta personal injury lawyer. If you are the victim of someone else's negligence or carelessness, whether in a traffic accident or some other type of accident, you have certain rights guaranteed by law. To help you understand these rights and seek the compensation for which you may be eligible, contact the Atlanta Law Offices of Sheryl L. Burke for a no-cost consultation on your injury claim. How do I know if I've been offered a fair settlement for my injuries? How is liability determined in a Georgia car accident claim? The driver that is considered liable in a Georgia car accident claim is the one at fault for causing the accident. Georgia traffic laws will often be cited when determining liability in a car accident. For instance, if someone violates the law by running a stop light or making an unauthorized U-turn, that driver would most likely be held liable in a Georgia personal injury case. In some cases, certain types of car accidents will result in an almost automatic assumption of liability. For instance, a person who crashes into the back of someone else's car is usually considered to be at fault for the rear-end collision. An exception to this automatic fault rule is if a driver rear ends you, and causes you to hit the car in front of you. In this case, the driver that struck you would be held responsible for initiating the chain reaction. In a Georgia personal injury case stemming from a car accident, you will need to provide evidence to support your claim. Your documentation may include photographs, witness statements, police reports, expert analysis and other applicable evidence. An Atlanta personal injury attorney can investigate your claim, and help you fight for the compensation to which you may be entitled. The insurance companies involved in handling your Georgia personal injury claim will be conducting their own assessment of the accident and damages before agreeing to a settlement. Your Atlanta personal injury attorney can negotiate with an insurance company to fight for a complete and fair settlement. You may be eligible to receive compensation for lost wages, medical expenses and pain and suffering, among other considerations. If you are the victim of someone else's negligence or carelessness, whether in a traffic accident or any other type of accident, you have certain rights guaranteed by law. To help you understand these rights and seek the compensation to which you may be entitled, contact the Atlanta Law Offices of Sheryl L. Burke for a no cost consultation. 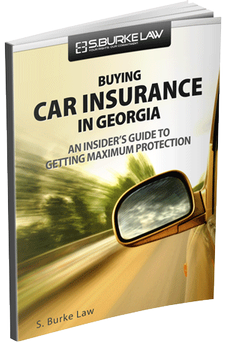 What are Georgia's motorcycle insurance requirements? 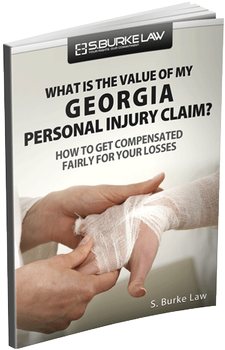 What types of damages can I recover through a Georgia personal injury claim? You may be eligible to recover damages from a Georgia personal injury claim based on 2 main categories: economic damages and non-economic damages. While economic damages are fairly easy to determine, determining non-economic damages is often difficult due to its subjective nature. Therefore, it is best to consult an experienced Atlanta personal injury attorney who can assist you with filing a claim for these damages and defending that claim in court if necessary. A traumatic brain injury (TBI) occurs from a blow, jolt or bump to the head that disrupts the normal function of the brain. This can happen when the head hits an object without warning or if an object makes contact to the head - in some cases piercing through the skull and damaging brain tissue. When a person experiences head trauma, it's important to seek treatment as soon as possible. If you or someone you love has experienced a traumatic brain injury and believe negligence may have been a factor; have an Atlanta personal injury lawyer assist you in determining your legal options for filing a Georgia personal injury claim. Although not all blows or bumps to the head will result in a TBI, a traumatic brain injury can range from mild to severe. The majority of TBIs that can occur on an annual basis are concussions, however even a mild concussion can lead to serious injury if it is not treated or a if secondary concussion occurs before the first one heals properly. Getting immediate medical treatment can help save a life or reduce the potential long-term effects of a traumatic brain injury. If you sustained a severe TBI because of the negligence of someone else, such as through a motor vehicle accident or slip and fall, you can get the legal opinion of an experienced Atlanta personal injury lawyer to see what options you may have for compensation to help with medical bills, lost wages, and other accident expenses. After a worksite accident in Georgia, do I have to see the doctor my employer chooses? Can I ever get a second opinion? 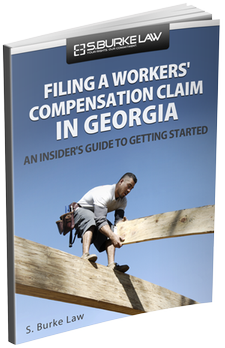 Under Georgia law, if you've been involved in a worksite accident, your employer must allow you to select a doctor from an established list, known as the Panel of Physicians. They should have already assembled this list for such situations. At your company's or their insurer's expense, you have the right to pick from the list any doctor to examine and treat you. Additionally, you can change to another doctor on the Panel without the insurance company's or the State Board of Workers' Compensation's approval. Please review the Panel of Physicians carefully. One of the clauses states that your employer or the insurance company can send you to a doctor of their choosing for an independent medical exam. This Panel has to be posted in an area that's noticed by all employees on the job site. Your Atlanta Workers' Compensation attorney can explain how your company should handle your injury and their responsibilities in the Workers' Compensation claims process as well as your personal responsibilities. Within a window of 120 days after receiving income benefits you can obtain a second opinion with a doctor of your choice. Additionally, you can get this second opinion through requesting permission from the State Board of Workers' Compensation. Despite the State of Georgia strictly enforcing this law, many companies choose to ignore the requirements. If you work for a company that fails to follow the regulations, you should speak with your Atlanta Workers' Compensation attorney right away to discuss your legal options. Remember, when you see the doctor, be careful in what you say because it can be held against you in the course of your Georgia Workers' Compensation claim. On personal injury cased, including wrongful death and medical malpractice, fees are on a contingency basis. That is, if you do not receive compensation for your injury, we do not charge a fee. All initial consultations are free. Can we settle out of court? A claim can be settled at any time. It can be settled before suit is filed, after suite is filed, and of course before trial is started. Suits and claims are also settled during and after trial. Statistically, most cased settle before trial and a few go to trial.